Sofrito de Puerto Rico - Puerto Rican Sofrito - Tienditadepuertorico.com - Buy Puertorican Food Here!! 1 Wash and seed the peppers. Chop peppers, onion, garlic, culantro and cilantro. achiote oil. Stain the seeds from the oil, taking care as seeds and oil strain. peppers are tender. Season with salt and pepper to taste. 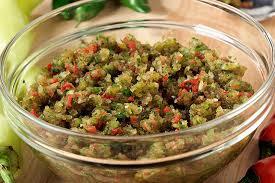 sofrito is generally used per serving of the bean, stew or rice dish.